Eddie and Roselma Sinclair were married in 1935 in the historic church of St James, Sutton West, Ontario, where the bride's parents and grandparents had been married. They had met while attending schools in Toronto, Eddie at the University of Toronto Schools and Roselma at Havergal College. Eddie graduated from the University of Toronto with a Degree in Dental Surgery in 1931. During his time there he distinguished himself in sports — track and field, swimming and water polo being his specialties. It was many years later that Roselma received her B.A. (Hons.) from Trent University, Peterborough. ​After graduation, Eddie practiced in Toronto, eventually transferring to the Ontario Hospital service at Whitby, Ontario. When war broke out, he enlisted in the Canadian Dental Corps and remained in military service until hostilities ceased. He returned, briefly, to Ontario hospital service until 1948 when the Sinclairs moved to Deep River. Eddie was given the noble title of Senior Research Officer (nothing so plain as dentist) with Atomic Energy of Canada. There they stayed for twenty–six years, raising their four children: Sandy, at one time the Association's Vice–President; deceased 1992; Ian, a specialist in anesthesia in Seattle and Vancouver; deceased 2015; Rory, a retired General Contractor and Hon. President of the Association; and Heather, a retired teacher at Durham Community College. In Deep River, Eddie was President of the Community Association and Roselma entered the field of municipal politics, becoming the first and only woman Warden of Renfrew County and Acting Mayor of Deep River. ​The Sinclairs retired to Norwood, Ontario in 1973 after Eddie's sight failed. Having guided Clan Sinclair Association from a family re–union in 1960 in Cleveland, Ohio to a viable organization with a membership between seventy–five and one hundred, in 1982 the Sinclairs turned over the offices of President and Secretary to Mac Sinclair and his daughter, Nancy. 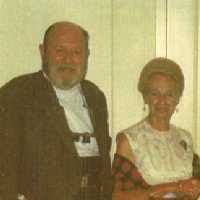 Eddie and Roselma remained loyal supporters of the Clan Sinclair Association, Canada and its neighbor organization, Clan Sinclair Association, U.S.A. until their passing in 1986 and 1994 respectively.